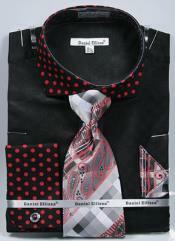 Mensusa https://www.mensusa.com/articles/the-lively-look-of-red-black-polka-dot-men's-shirt.html The Lively Look Of Red Black Polka Dot Men's Shirt When you get bored with your regular solid color shirts or the stripes, try wearing something different like the red black polka dot men's shirt that go well with any blazers like the red velvet tuxedo jacket or plaid tuxedo jacket. You will feel relaxed and look outstanding too. Some men love to go beyond the traditional looks and create their own style statement. For such stylish men, the appropriate choice is a red black polka dot men's shirt. The color combination of this designer shirt allows you to wear any other blazers or jackets as you wish. Since the shirt has red polka dots, a red jacket or red velvet blazer will look simply great. Tuxedos are the most sophisticated suits that create a complete look for a man who wears the perfect fitted suit. To enhance his looks, a better choice will be a white tuxedo black lapel with matching dress shirts like red black polka dot or designer black dress shirts or any other shade that suits you well. Visit MensUSA to pick up the trendiest white tuxedo black lapel to portray your fashion sense. If you are not too sure of the accessories, take the advice of experts at the stores to select the most appropriate shirts and ties to look outstanding and smart. Tuxedos are made of various fabrics. 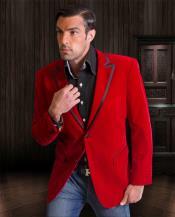 If you visit MensUSA you will surely be attracted to the magical collection of red velvet tuxedo jacket. The attractive appearance of the velvet jacket makes you feel that this is the best that you can buy. The texture is extremely soft and the shine of the velvet makes the red velvet tuxedo jacket the ideal wear for a gorgeous evening. The jacket is especially designed with broad lapels and deep pockets where you can easily keep your belongings. Moreover, the red velvet tuxedo jacket is of a kind that draws the attention of all men because it is the exquisite work of master tailors. Every detail is perfect that gives the wearer a smart and sophisticated look. Prom night is that night where every visitor wants to show off his/her beauty and manliness. Hence prom apparels are exclusively created by designers to fulfill the dreams of every individual. Men's prom tuxedo is no exception. It is crafted diligently to offer maximum comfort along with outstanding looks to the wearer. There are various colors for you to choose from. Often men go for those men's prom tuxedo that matches with that of their girl friend's prom dresses to create a balance in their outfits. The best place to buy your men's prom tuxedo is MensUSA, the most reliable and reasonable store in town that always offers the best and the most unique attire. Tuxedo jackets have been the most stylish outwear of affluent men. Today they are worn by all men who wish to look smart and decent. The plaid tuxedo jacket offers a trendy look. There is a great variety of such plaid jackets designed for different occasions. The subtle designer plaid tuxedo jacket is just perfect for office wear while the bold patterns are just what you need to rock the parties. At MensUSA you will find a fantastic collection of plaid tuxedo jacket for every event and of various sizes and shades. You will find the simple, window pane patterns and the conservative styles. Select the one that portrays your personality and enhances your looks.